I'm finally back from my Vegas/Utah trip, but mentally I still feel like I'm on vacation. I have two posts left with almond nails before I can dive into all of the new stuff with you guys. I'm hoping to get those posted by tomorrow or Wednesday. After that, I will have a Cosmoprof North America recap, and a Cocktails & Colors recap to share with you all. Now that you kind of know this week's schedule, let's back up and enjoy Cupcake Polish Dream. Notes: I feel like you really can't go wrong with holo glitter in any form. This may seem a bit wintery for the dead of summer, but I like to toss things up a bit. If you live somewhere that has a similar climate to Oregon, you probably don't get to see the sun any other time of year. I figure it's best to enjoy holos when it's nice outside. 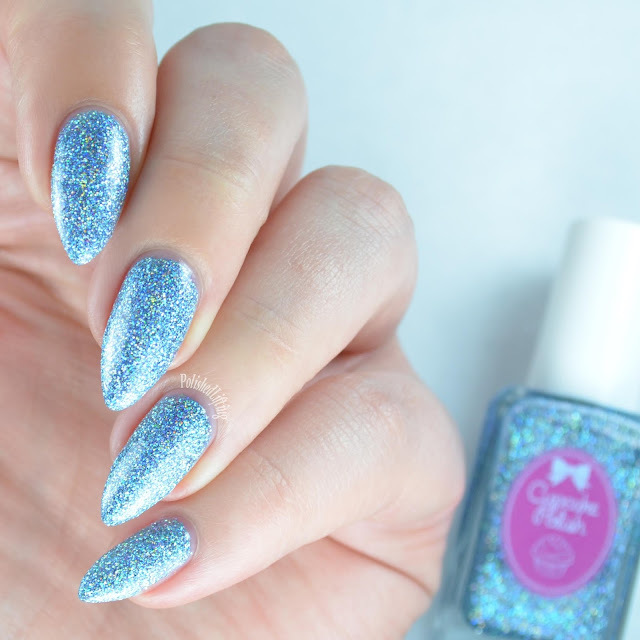 Cupcake Polish Dream is currently available on her website for $13/bottle plus shipping.